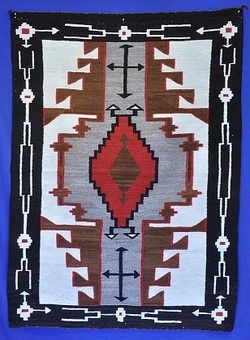 To view our available Navajo weavings from this era, please click here. By 1900 the Trading Post system was well-established. The Navajo, who had woven blankets throughout the 19th century, responded to the new economic system that the trading posts created. Encouraged by the traders to weave rugs for the new Anglo market, instead of blankets for the native market, Navajo weavers transitioned from making shoulder garments to floor rugs. These floor rugs were larger, heavier pieces, with central design elements and defined borders, and replaced the smaller banded or open format blankets. 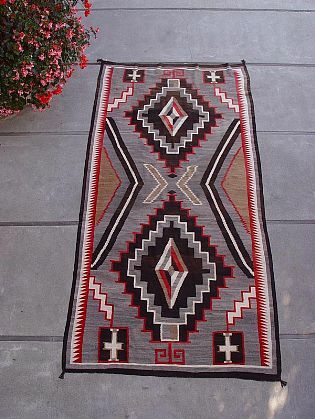 With 30 years of development, the Navajo rug became a prized item for the American market; the rug industry hit its high watermark between 1910-1930. The Navajo population had more than tripled since the end of the Indian War; from about 9,000 in 1868 to 20,500 in 1898 and then to 31,250 in 1918. (To note: In 2000 there were over 175,000 Navajo in the census). The sheep were healthy, the weather was good and forage was plentiful. High quality hand spun wool yarns are typical of this period. Many traders recognized that high quality rugs sold better than common grade rugs and that the American market was also buying high quality Persian rugs. Consequently, traders such as J.B. Moore of Crystal Trading Post and Lorenzo Hubbell of Ganado Trading Post encouraged the Navajo to weave high-quality rugs and assisted in helping improve the sheep herds, providing quality dyes, and even favored certain patterns and color pallets which proved to be especially strong on the market. The market was strong as America was growing economically and collecting became popular. The Arts and Crafts movement developed, and Navajo rugs were a perfect match for this new interior design. The designs were well-thought-out for the market they were sold to. The traders, ever the entrepreneurs, were able to influence the Navajo to weave to customers' tastes and demands. The big ranches needed rugs, as did the new hotels in Santa Fe and those popping up on Route 66 and along the railroad. The Rug Room at the Hubbell Trading Post in Ganado, Az. shows off the small paintings of rugs on the wall which were the favored rugs of Lorenzo Hubbell. These were used both to sell patterns to clients, and to direct weavers which rug to weave next.